The latest secret to better room service: technology. At the Hotel 1000 in Seattle, wired minibars alert staff when specific bottles need to be replenished (doubles from $400; 206-957-1000). At the Umstead Hotel and Spa in Cary, North Carolina (slated for a January opening), room-service trays with microchips send a signal when they’ve been placed outside the door (doubles from $295; 866-877-4141). 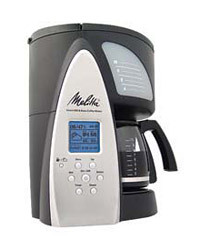 key facts Melitta’s new machine offers two morning must-haves: coffee and the weather report. special features Its wireless Microsoft system displays the current weather and gives a four-day forecast. key facts Created with BMW Designworks, Ecopod’s home recycling unit crushes plastic bottles and aluminum cans. special features The Ecopod stores up to 50 bottles and cans after they’ve been sorted and flattened. key facts Kohler’s first hands-free faucet for the home kitchen also functions as an automatic water dispenser. special features The faucet—in chrome or stainless steel—turns on when hands are five inches away. key facts This PC has a touch screen in addition to a keyboard, making it more spill-resistant—perfect for the kitchen. special features Its Integrated Personal Video Recorder can record, play and pause TV cooking shows. Publish your own cookbook using Blurb’s downloadable program (from $19; blurb.com).